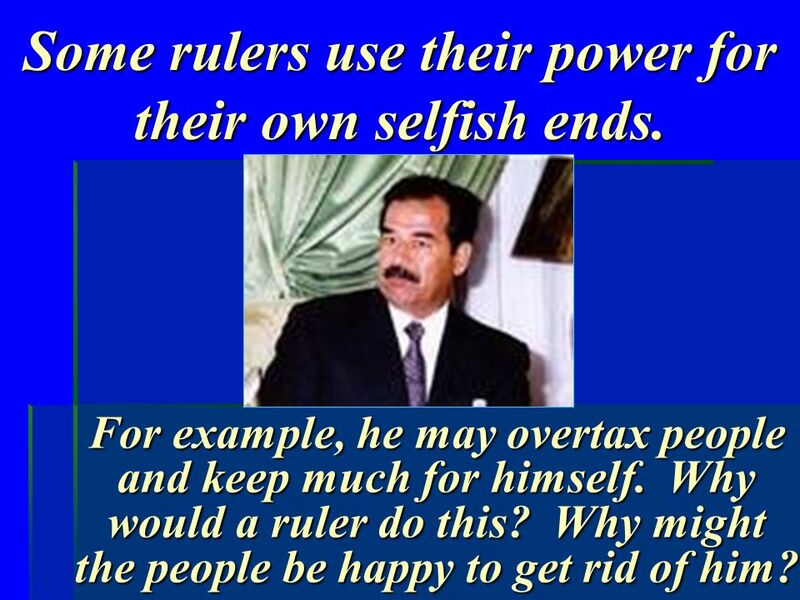 2 Some rulers use their power for their own selfish ends. For example, he may overtax people and keep much for himself. Why would a ruler do this? Why might the people be happy to get rid of him? 3 Jesus is not that kind of ruler. 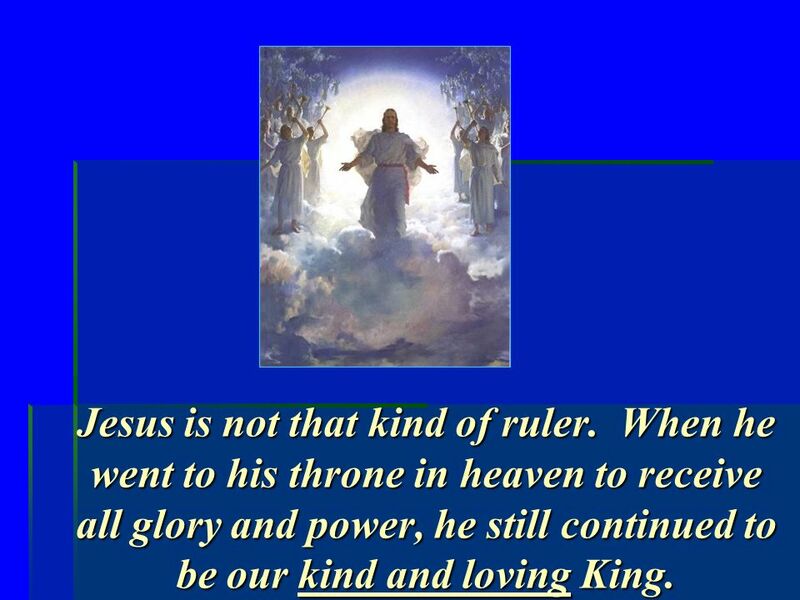 When he went to his throne in heaven to receive all glory and power, he still continued to be our kind and loving King. 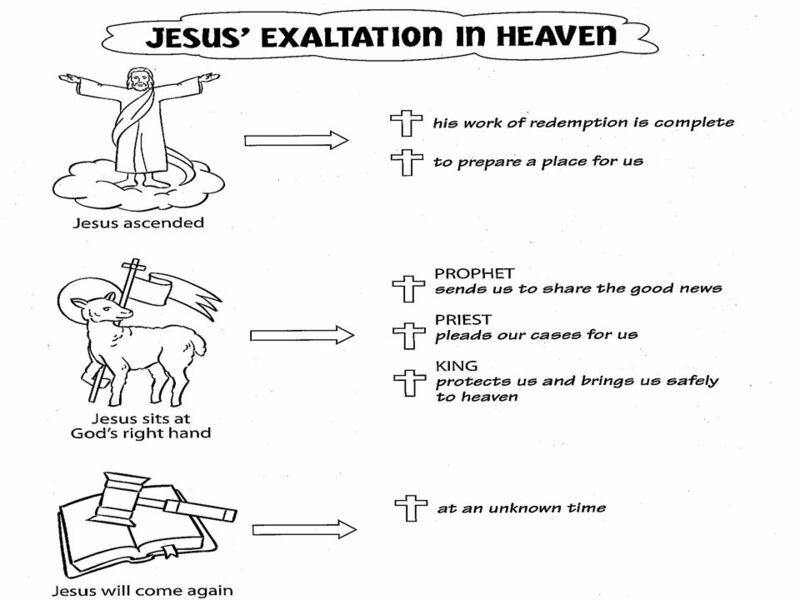 4 Aim: Why is Jesus exaltation in heaven so meaningful for us every day? 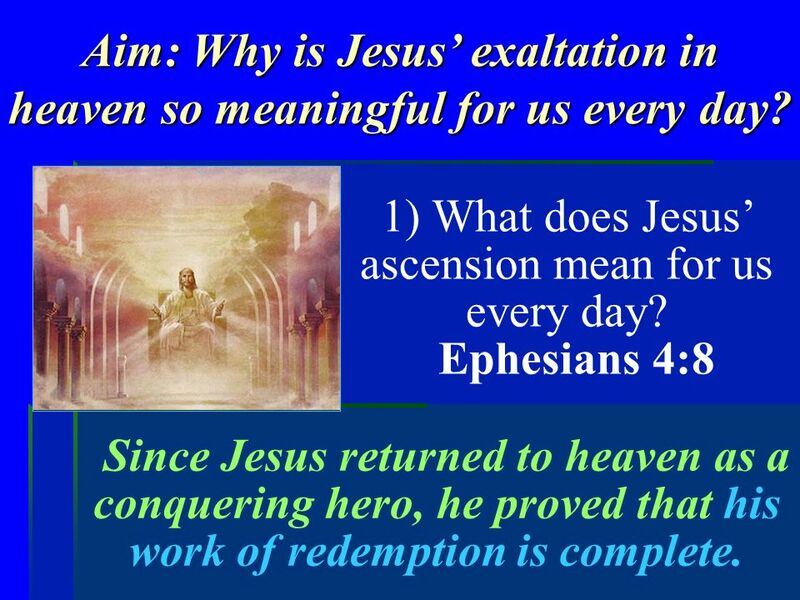 1) What does Jesus ascension mean for us every day? Ephesians 4:8 Since Jesus returned to heaven as a conquering hero, he proved that his work of redemption is complete. 6 When David killed Goliath it was a victory for Gods people and Gods people received David as a conquering hero. 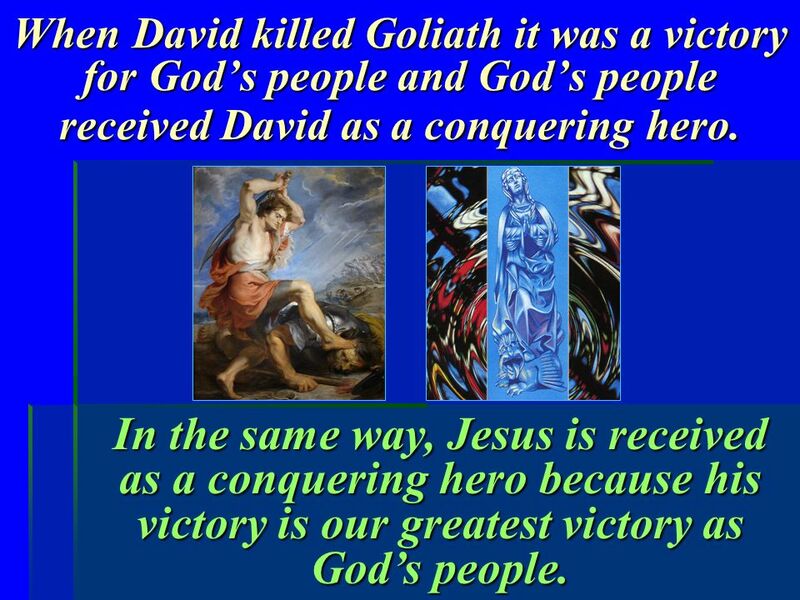 In the same way, Jesus is received as a conquering hero because his victory is our greatest victory as Gods people. 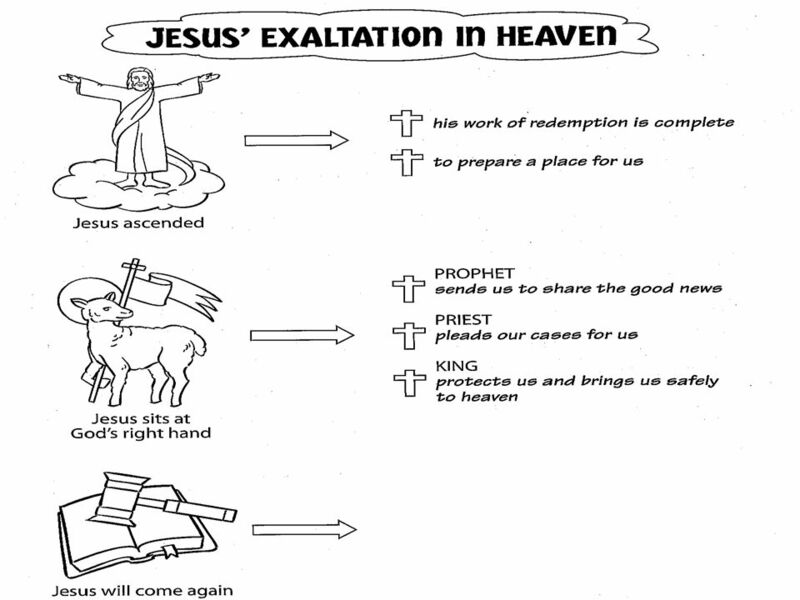 7 Aim: Why is Jesus exaltation in heaven so meaningful for us every day? 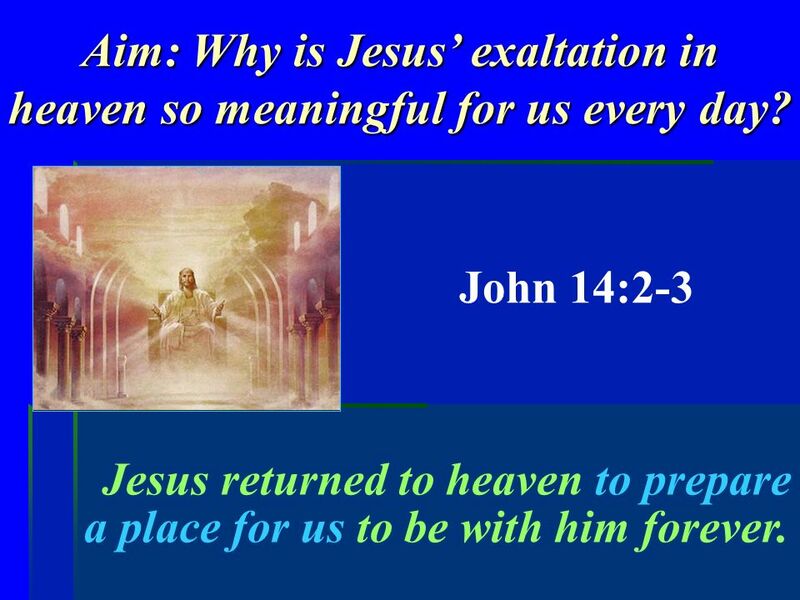 John 14:2-3 Jesus returned to heaven to prepare a place for us to be with him forever. 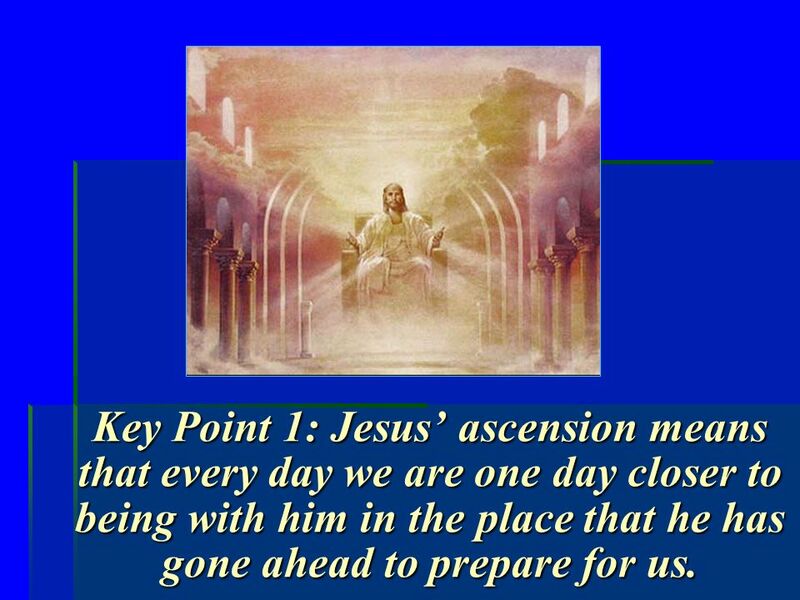 10 Key Point 1: Jesus ascension means that every day we are one day closer to being with him in the place that he has gone ahead to prepare for us. 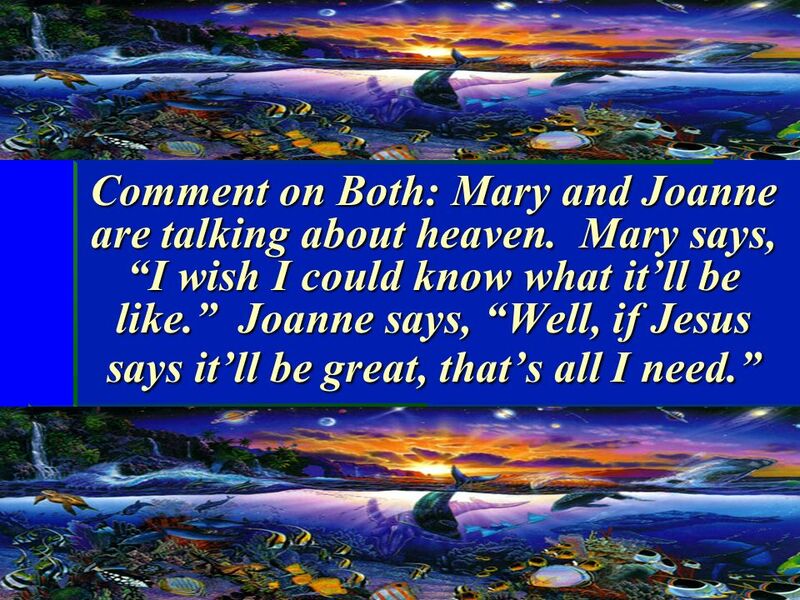 11 Comment on Both: Mary and Joanne are talking about heaven. Mary says, I wish I could know what itll be like. Joanne says, Well, if Jesus says itll be great, thats all I need. 12 Aim: Why is Jesus exaltation in heaven so meaningful for us every day? 2) What does Jesus sitting at the right hand of God mean? 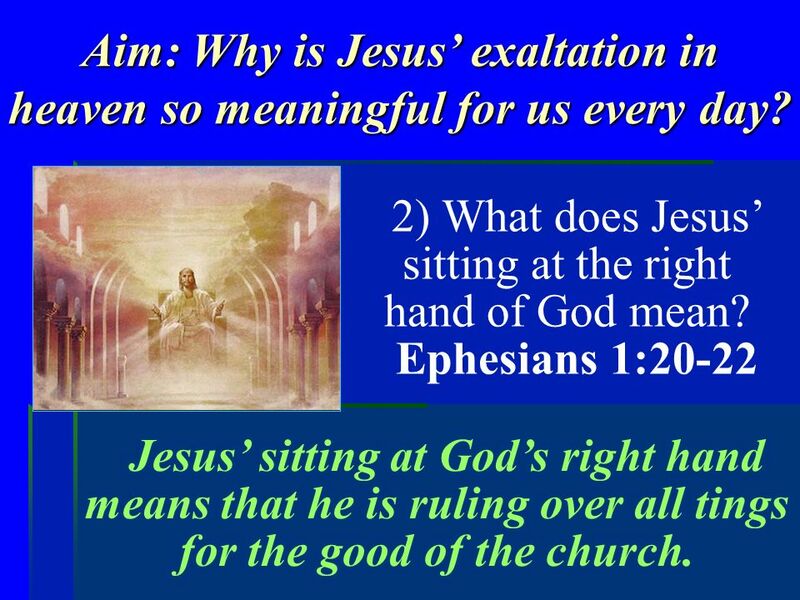 Ephesians 1:20-22 Jesus sitting at Gods right hand means that he is ruling over all tings for the good of the church. 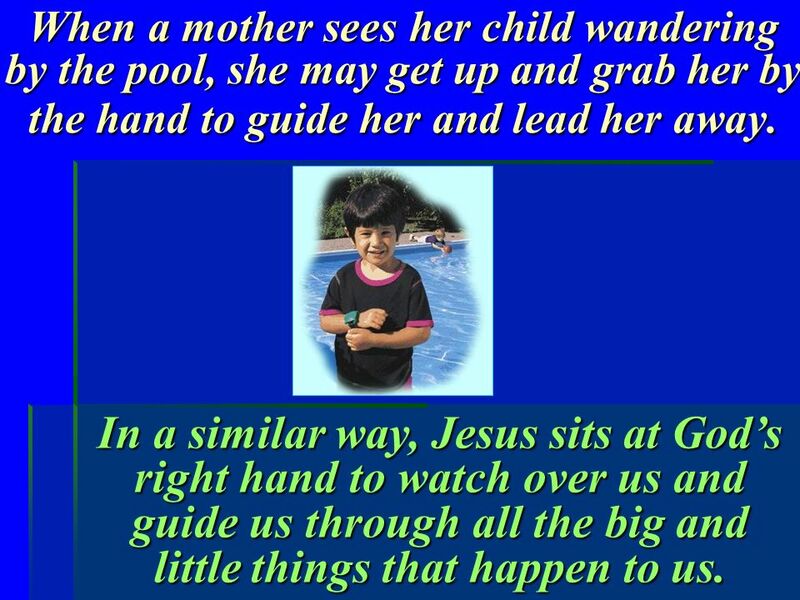 13 When a mother sees her child wandering by the pool, she may get up and grab her by the hand to guide her and lead her away. In a similar way, Jesus sits at Gods right hand to watch over us and guide us through all the big and little things that happen to us. 14 Aim: Why is Jesus exaltation in heaven so meaningful for us every day? 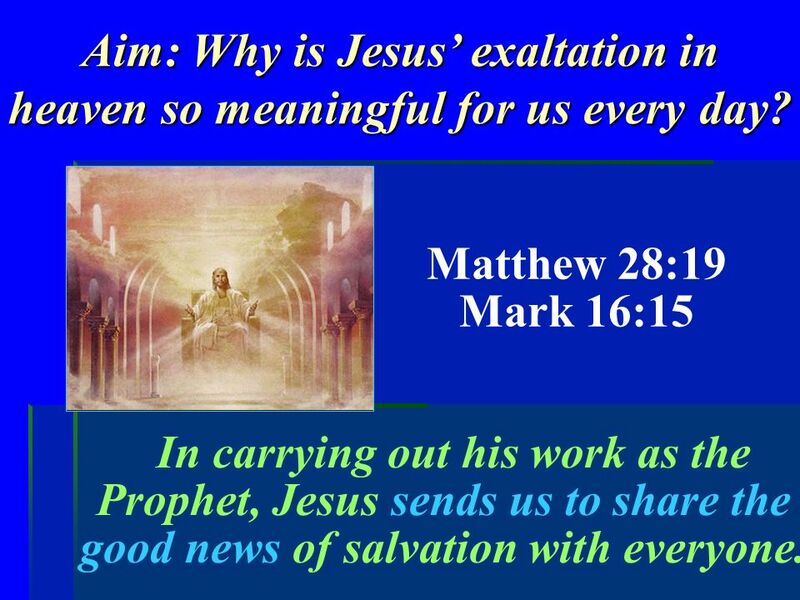 Matthew 28:19 Mark 16:15 In carrying out his work as the Prophet, Jesus sends us to share the good news of salvation with everyone. 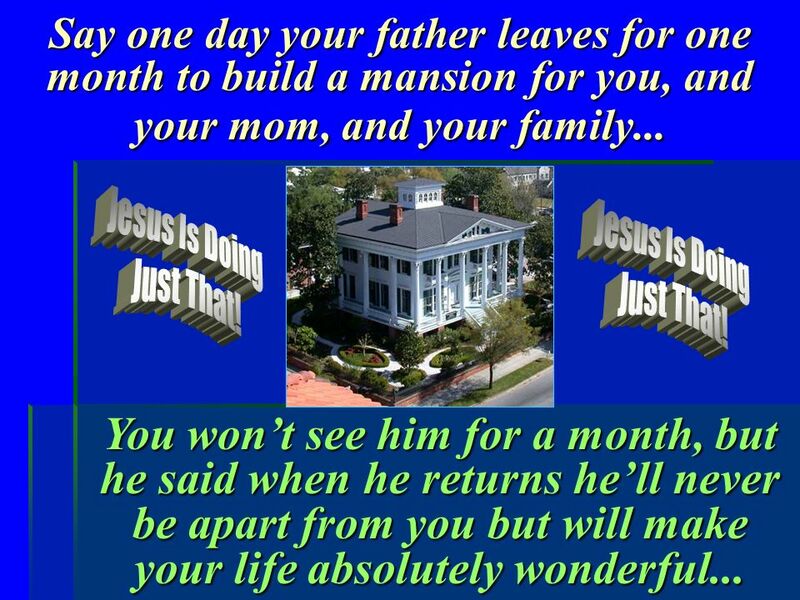 16 We learned in earlier lessons that Jesus in his ministry preached to people where he went. 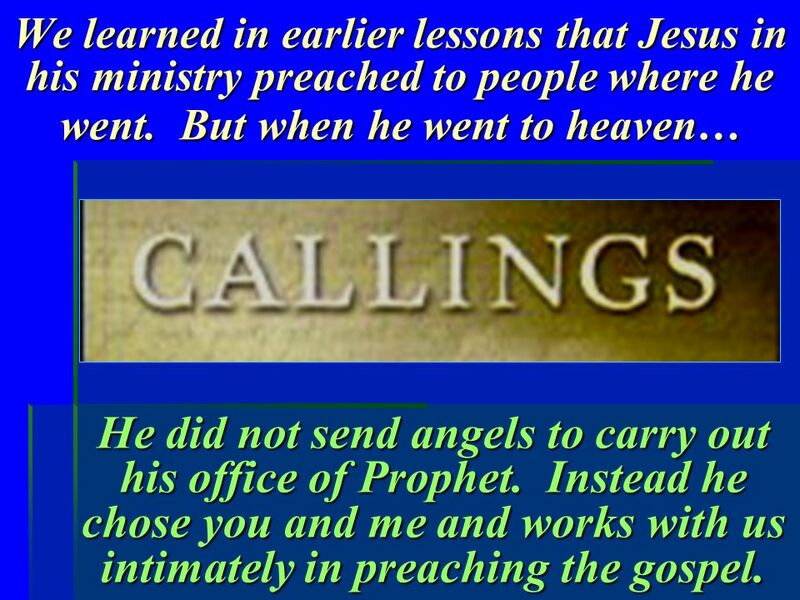 But when he went to heaven… He did not send angels to carry out his office of Prophet. Instead he chose you and me and works with us intimately in preaching the gospel. 19 Suppose you have to go to court and answer for charges brought against you. Youll want a good lawyer, right? 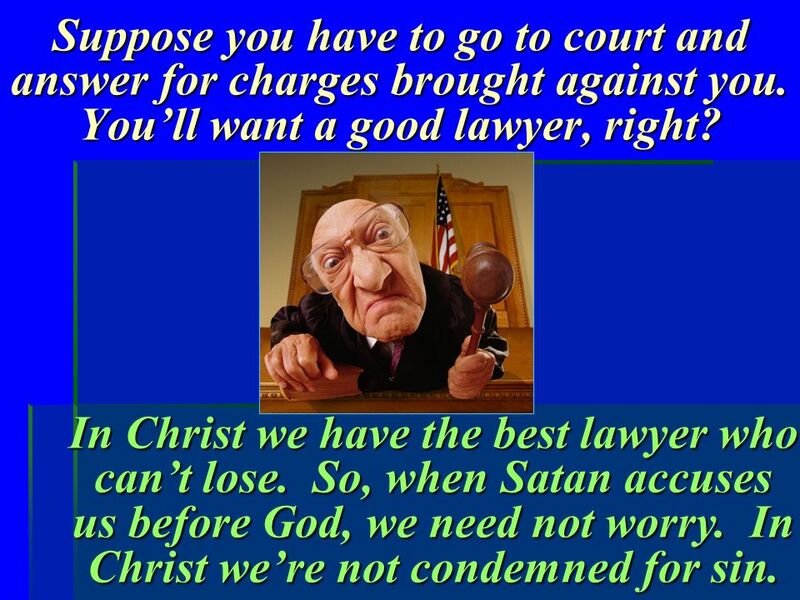 In Christ we have the best lawyer who cant lose. So, when Satan accuses us before God, we need not worry. In Christ were not condemned for sin. 20 Aim: Why is Jesus exaltation in heaven so meaningful for us every day? 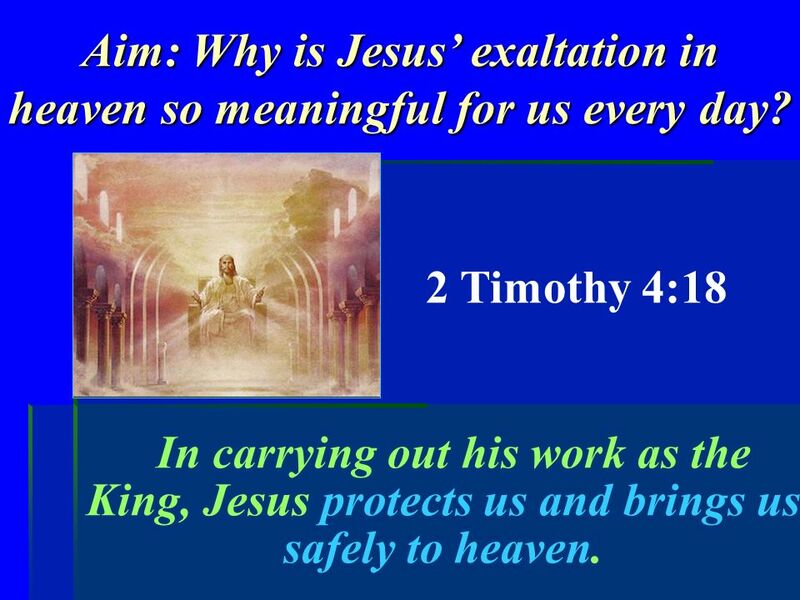 2 Timothy 4:18 In carrying out his work as the King, Jesus protects us and brings us safely to heaven. 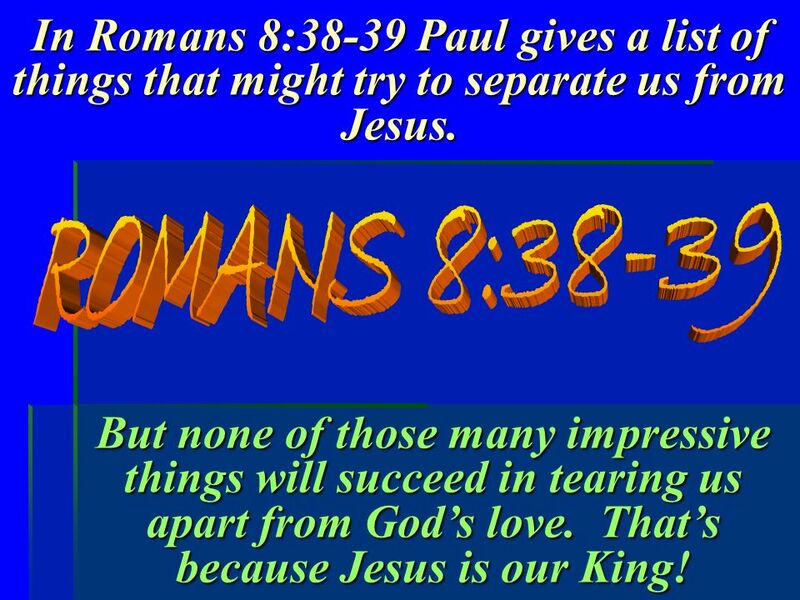 22 In Romans 8:38-39 Paul gives a list of things that might try to separate us from Jesus. But none of those many impressive things will succeed in tearing us apart from Gods love. Thats because Jesus is our King! 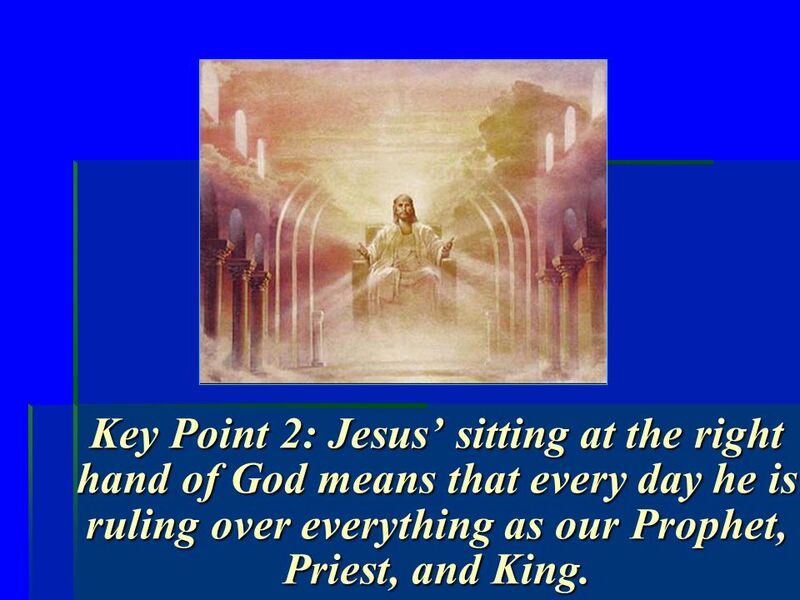 23 Key Point 2: Jesus sitting at the right hand of God means that every day he is ruling over everything as our Prophet, Priest, and King. 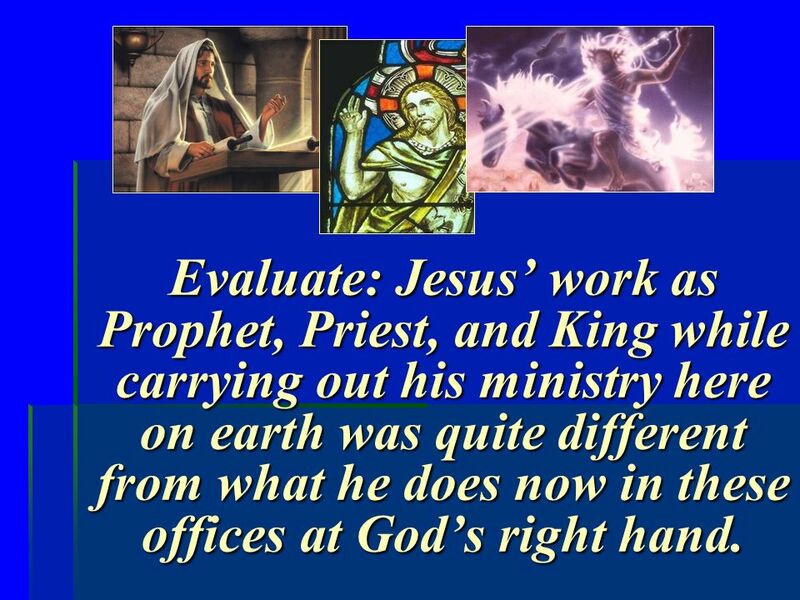 24 Evaluate: Jesus work as Prophet, Priest, and King while carrying out his ministry here on earth was quite different from what he does now in these offices at Gods right hand. 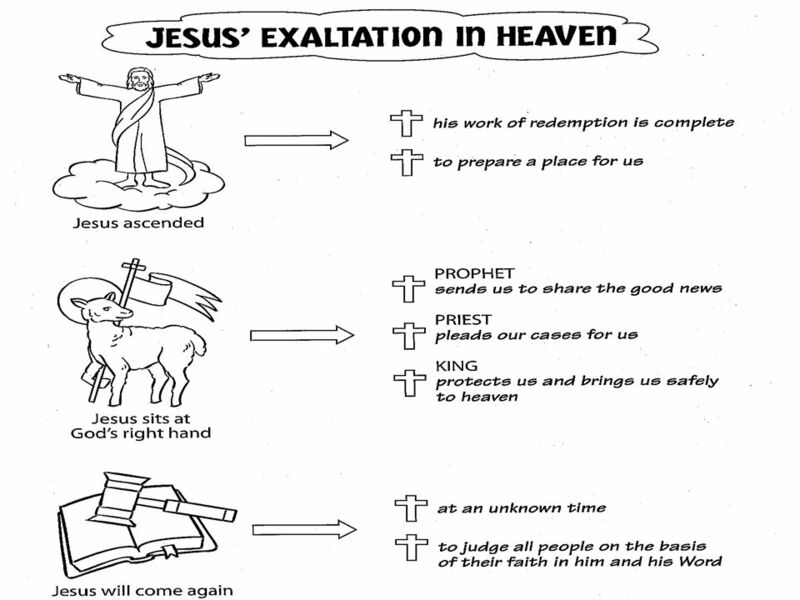 25 Aim: Why is Jesus exaltation in heaven so meaningful for us every day? 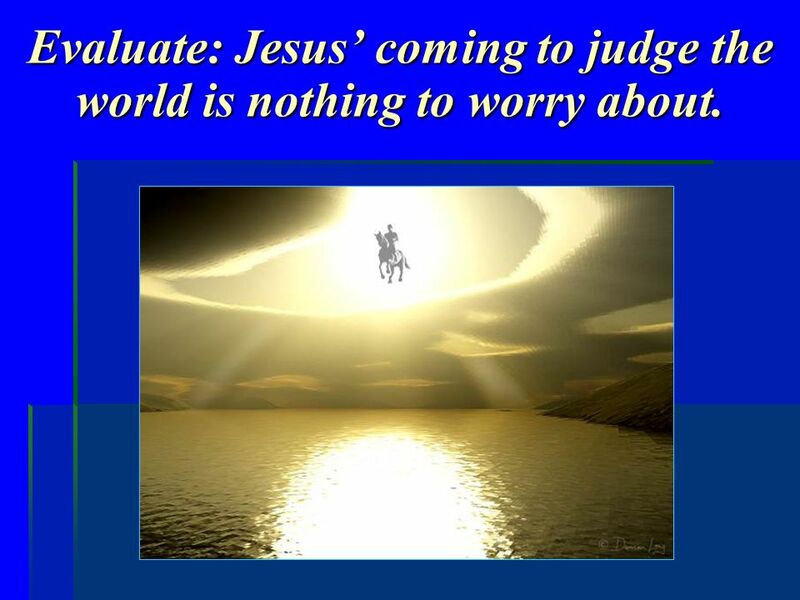 3) What does Jesus coming to judge the world mean for us every day? 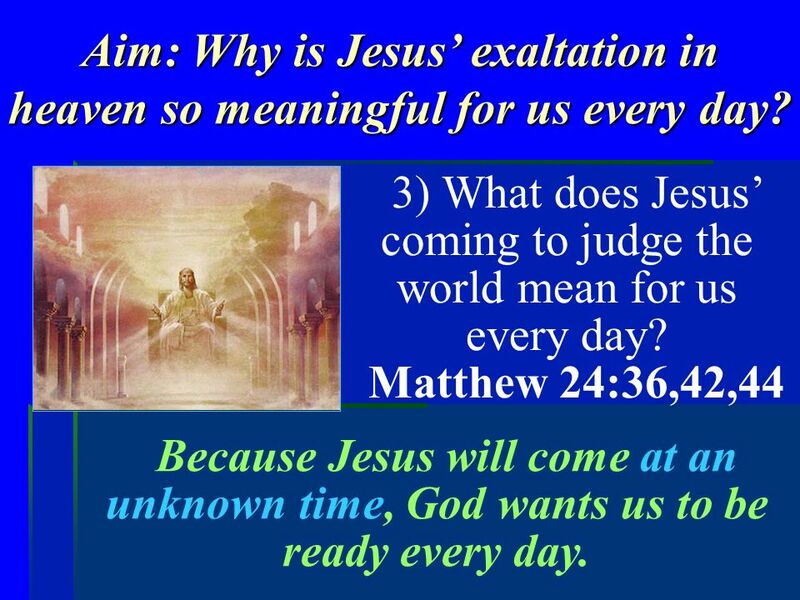 Matthew 24:36,42,44 Because Jesus will come at an unknown time, God wants us to be ready every day. 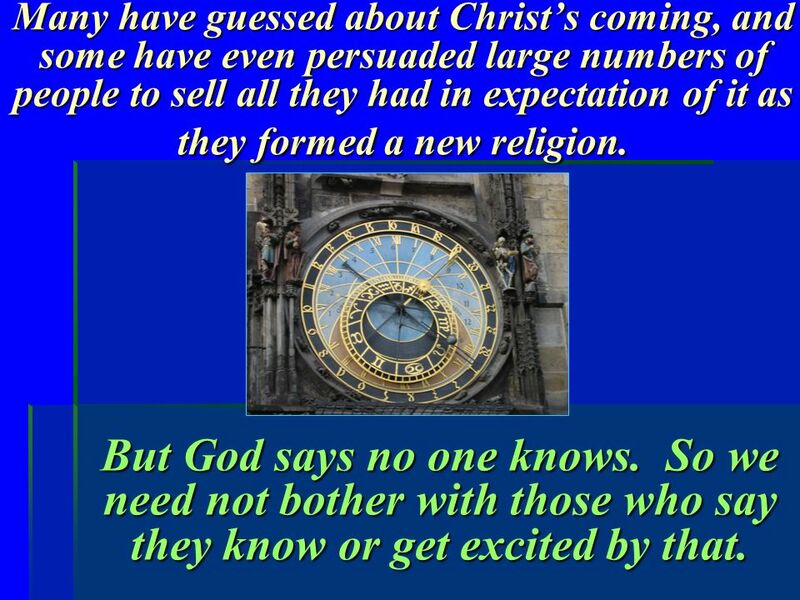 27 Many have guessed about Christs coming, and some have even persuaded large numbers of people to sell all they had in expectation of it as they formed a new religion. But God says no one knows. So we need not bother with those who say they know or get excited by that. 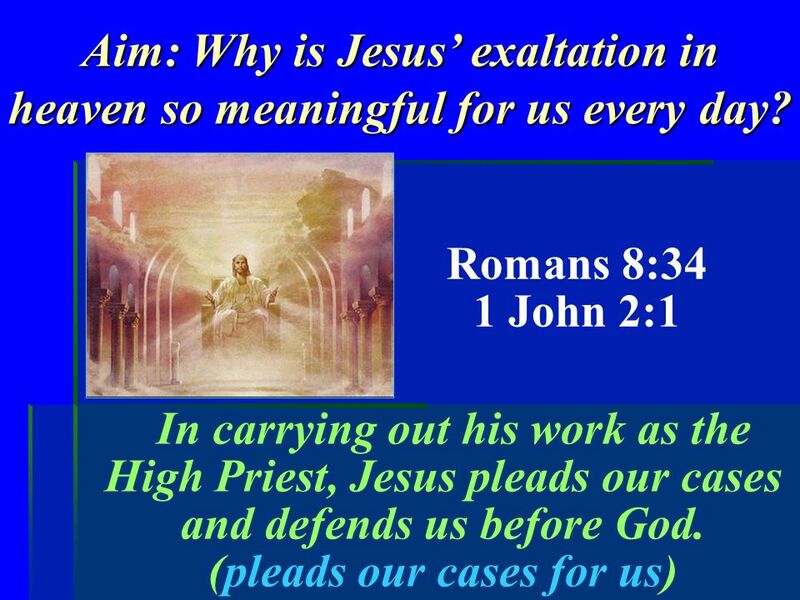 28 Aim: Why is Jesus exaltation in heaven so meaningful for us every day? 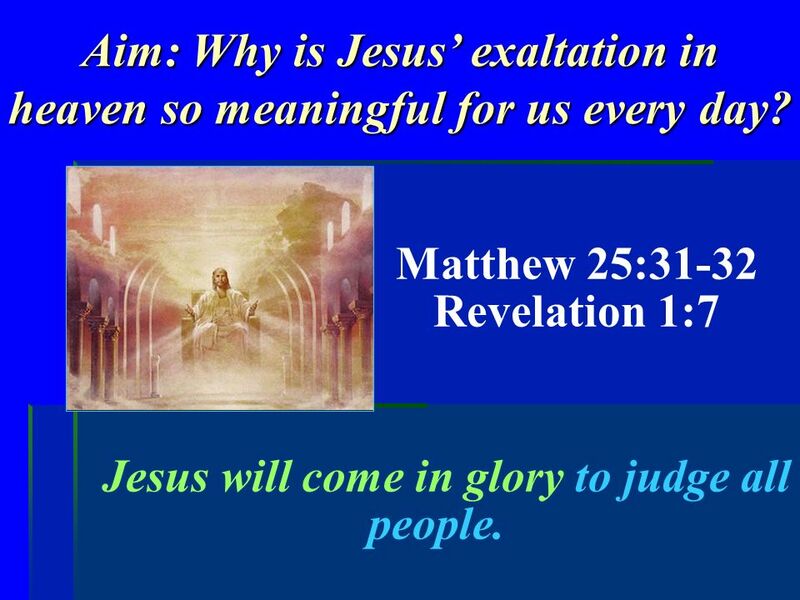 Matthew 25:31-32 Revelation 1:7 Jesus will come in glory to judge all people. 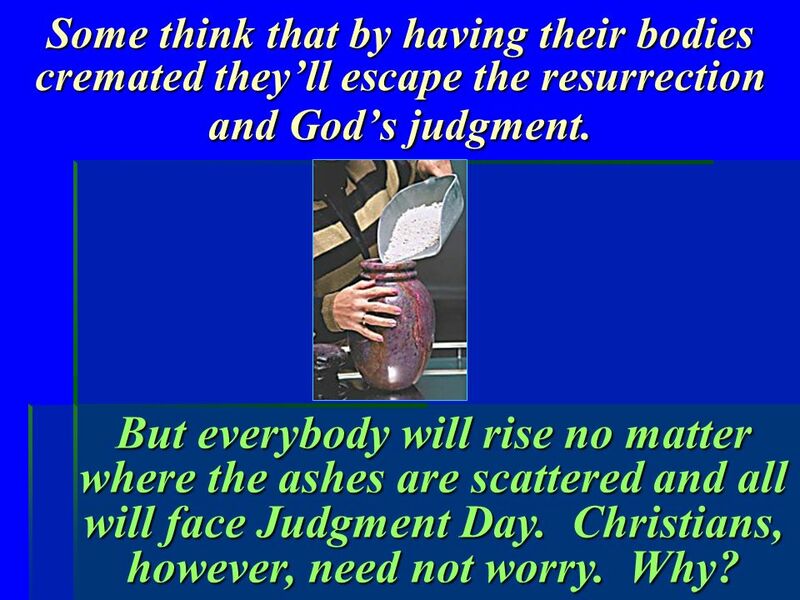 30 Some think that by having their bodies cremated theyll escape the resurrection and Gods judgment. But everybody will rise no matter where the ashes are scattered and all will face Judgment Day. Christians, however, need not worry. Why? 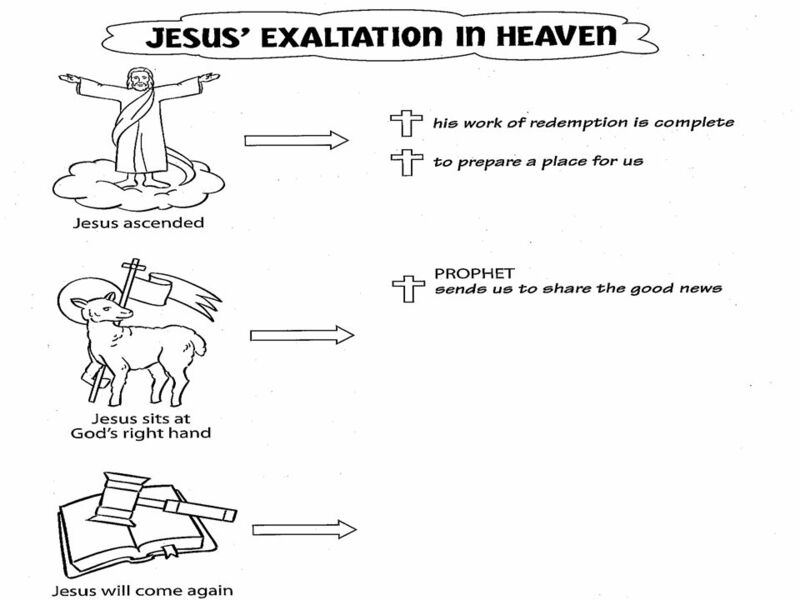 31 Aim: Why is Jesus exaltation in heaven so meaningful for us every day? 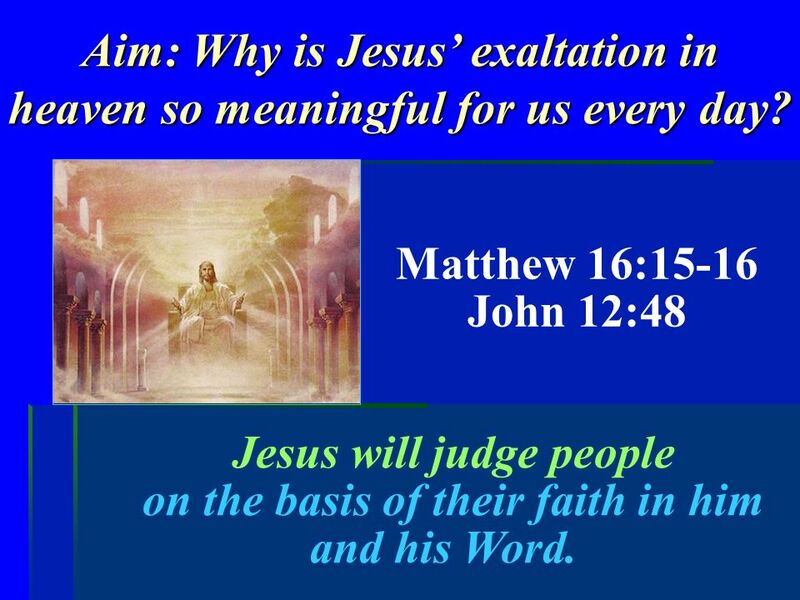 Matthew 16:15-16 John 12:48 Jesus will judge people on the basis of their faith in him and his Word. 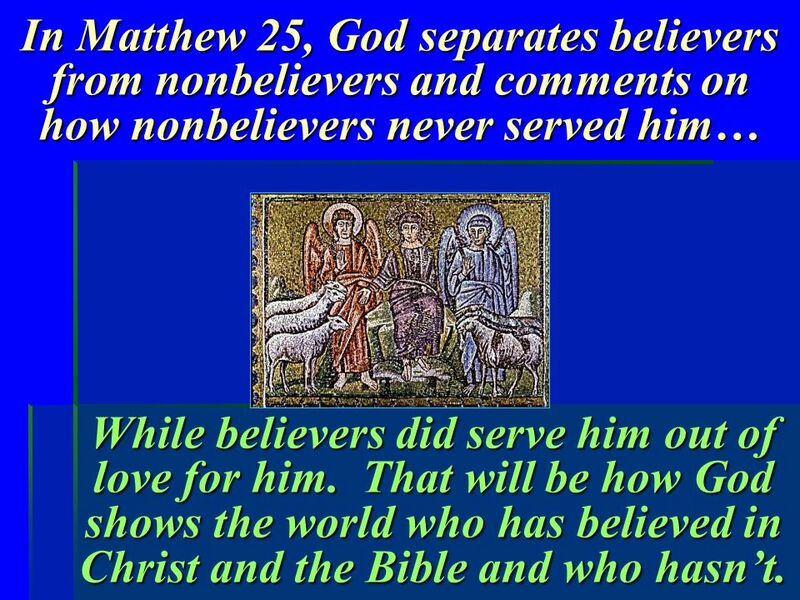 33 In Matthew 25, God separates believers from nonbelievers and comments on how nonbelievers never served him… While believers did serve him out of love for him. That will be how God shows the world who has believed in Christ and the Bible and who hasnt. 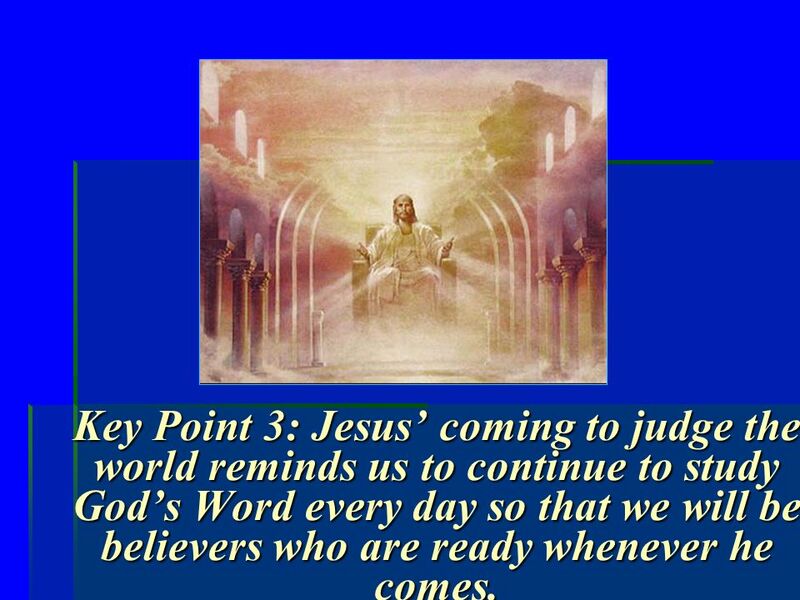 34 Key Point 3: Jesus coming to judge the world reminds us to continue to study Gods Word every day so that we will be believers who are ready whenever he comes. 35 Evaluate: Jesus coming to judge the world is nothing to worry about. 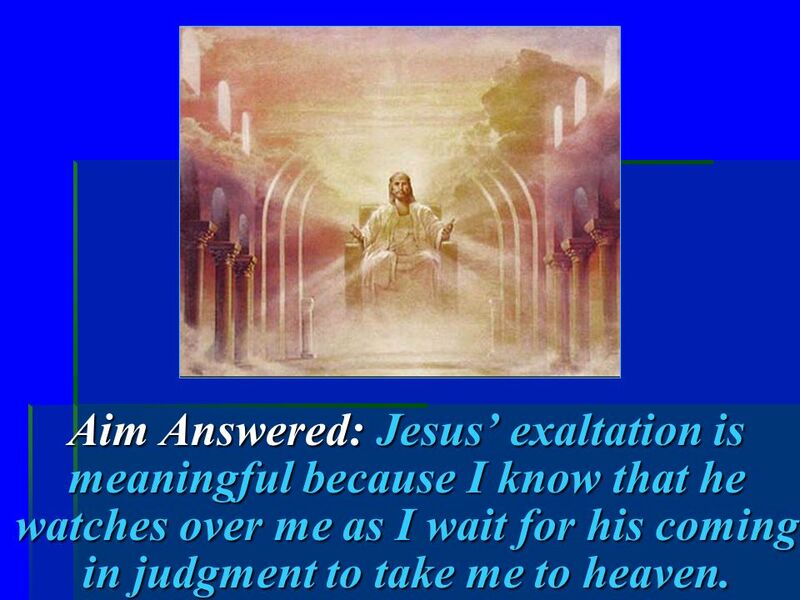 36 Aim Answered: Jesus exaltation is meaningful because I know that he watches over me as I wait for his coming in judgment to take me to heaven. 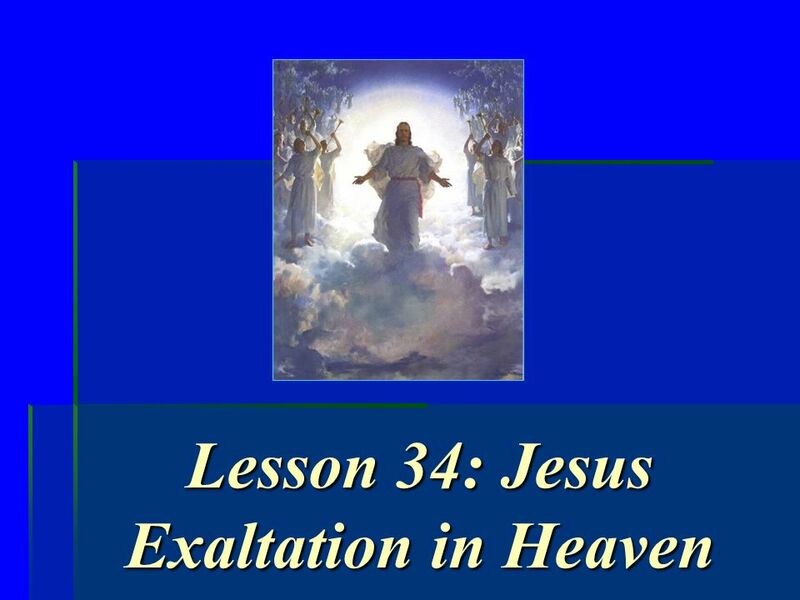 Download ppt "Lesson 34: Jesus Exaltation in Heaven. Some rulers use their power for their own selfish ends. For example, he may overtax people and keep much for himself." 2 CAN I FACE THE MUSIC? Will There Be Tears Up In Heaven? SO, THEN, EVERYONE OF US SHALL GIVE ACCOUNT OF HIMSELF TO GOD. ROMANS 14:12. ARTHUR DURNAN MINISTRIES. VS BETTER. That you may approve the things that are excellent Philippians 1:9-11 BETTER VS Whom should I date/marry? What kind of music should I listen.